Freelance writer for feature articles, web content and blogs. Specializing in non-fiction articles on a range of subjects including lifestyle, travel, architecture and product reviews. Aerial view. Courtesy Adelaide Now website. 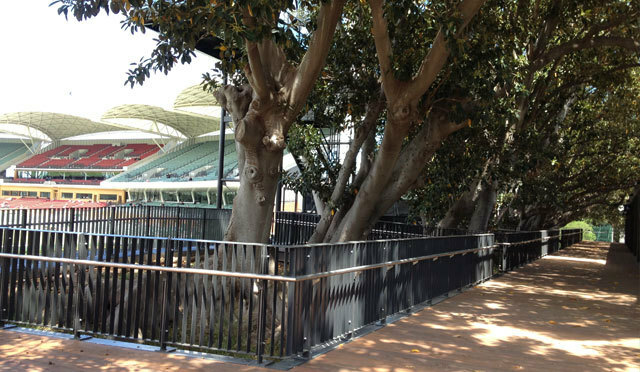 Built in 1871 Adelaide Oval boasts a rich sporting history particularly with football and cricket. 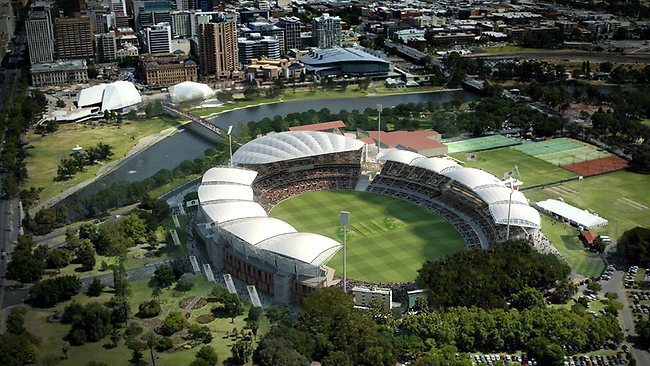 The new $535M development will include two new southern and eastern stands, and a new entrance plaza and footbridge as part of the Riverbank Precinct upgrade. Work proceeds in earnest on the Southern stand. Image by writer. The southern stand and upgraded light towers have been completed, as well as resurfacing and levelling of the oval. The old 'hallowed turf' was given away to residents in 300x300mm pieces a few months ago- new turf grown in Langhorne creek is being installed. 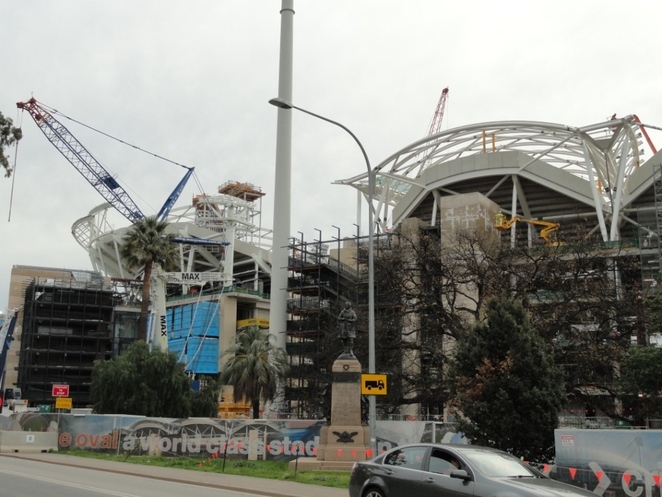 The Southern stand roof will become a unique feature of Adelaide's skyline and one of the most visible elements of the stadium from the CBD. South elevation. The massive grandstands are larger than most people would have realized, and almost as tall as the adjacent cathedral! Courtesy Adelaide Now website. The development has not been without controversy. Adelaide Oval was considered in international sport to be one of the world's most picturesque grounds. It's a pity that this will be lost, and many would argue that the effort to retain the famous 'hill' is merely tokenism. The iconic Moreton Bay fig trees and the heritage scoreboard will be retained in a new look northern mound featuring timber decking and improved food, beverage and toilet facilities. Courtesy Stadium Management Authority website. The loss of some trees from the surrounding grounds has also caused some consternation, and questions have been raised as to whether the car parking will be adequate. The Adelaide City Council is still arguing with the SANFL which is demanding access to the parklands and all the revenue from parking. 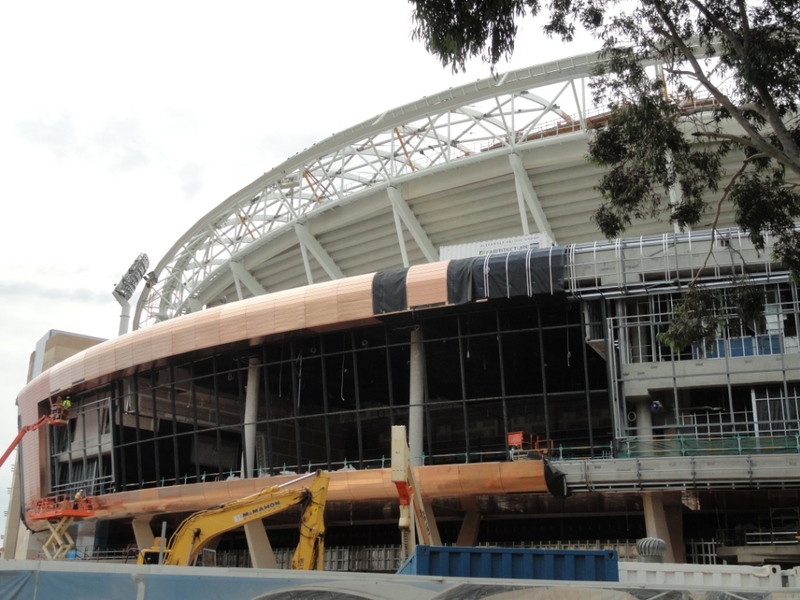 The view from War Memorial drive of the copper cladding to the function rooms. Image by writer. The new look Adelaide oval will be complete enough to host an Ashes test match in December. The stadium and surrounds will be fully finished by 2014 in time for the season opener 'showdown' match between Adelaide's two AFL teams; the Crows and Port Power. What do you think of the new look stadium? Please leave a comment. 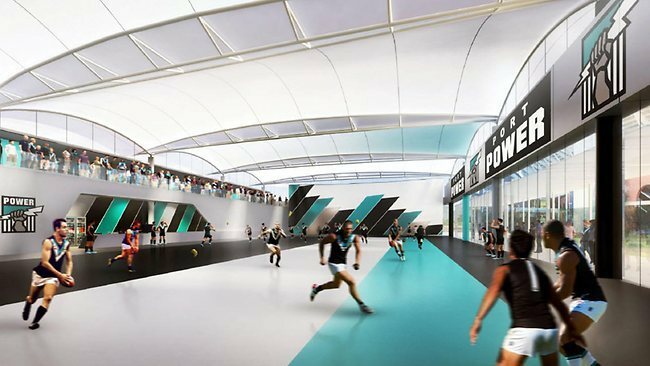 The new change rooms will look like high-tech aircraft hangers. Go Power! Image courtesy Herald Sun website. Looks like tree climbing is out now. Looking at it now, you'd never have guessed how old it was. the skyline in Adelaide is looking so different. So modern and new. They are exciting changes! So the change rooms are big enough to play footie in AND there's a viewing gallery for fans above??? All the history is lost. The city had best be reaping the rewards for any parking revenue... blast the SANFL! They will be making out like bandits with the new facility anyway.